“Watch for Motorcycles” at Hogs N Dogs! | Hupy and Abraham, S.C.
“Watch for Motorcycles” at Hogs N Dogs! 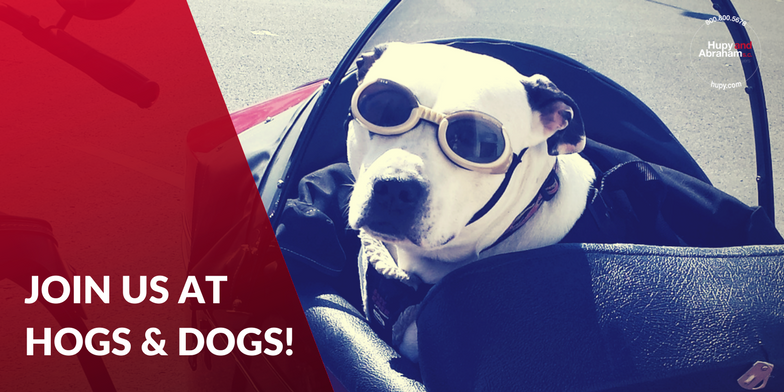 Join us this weekend for your fill of both pet dogs and hot dogs at Milwaukee Harley-Davidson’s Hogs N Dogs event! Running noon-2 p.m., you can bring your (leashed and sociable please!) furry friend to the dealership for a fun event for everyone. Help support the Rolling Thunder Wisconsin Chapter 2 when you grab a tasty meal for yourself, and spoil your pooch with treat samples from Exclusively Pet, Inc. While at the dealership, don’t forget to check out their exciting lineup of 2018 motorcycles! The dealership also features the largest inventory of pre-owned motorcycles in the U.S., plus great opportunities to get up to speed on everything exclusive from 115th anniversary gifts to Sturgis Rally Tours! Don’t forget to grab your FREE “Watch for Motorcycles” sticker or our BRAND NEW “Watch for Me” stickers this weekend at the event! Also, find our event booth at any of these great motorcycle events this year for your chance to get a FREE pinstripe buff for you OR your furry friend!